A few years ago I had the deck of my home rebuilt. The old one was ancient and rickety and had to be replaced! The new deck turned out beautifully and so of course, I just had to buy new chairs and planters and things to decorate it. 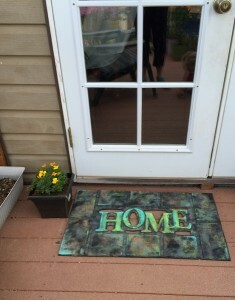 One of my favorite deck decorations was a welcome mat that had the word “home” on it. It was painted with kind of a rustic look and I thought it was beautiful. I really love my deck, it feels so homey to me and the welcome mat was the perfect finishing touch! Over the years the feet of friends and family, kids and grandkids have walked back and forth across that mat many times. The paint began to fade until eventually it was all gone. Finally, all that was left was a plan black mat (although it did still have the word “home” on it). I kept it around because, well, it did still do it’s job of keeping dirt from being tracked into the house. It wasn’t the mat’s fault that it’s paint had become old and faded. 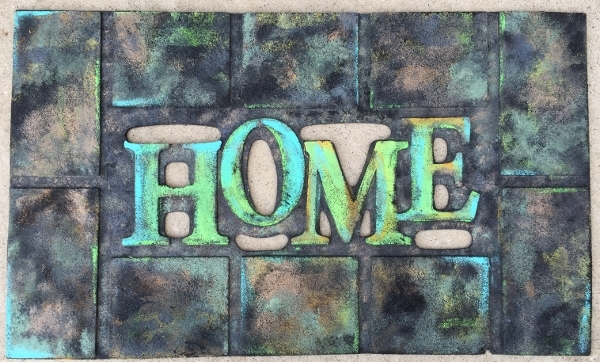 One day as I walked past my old welcome mat into my house, inspiration struck me! 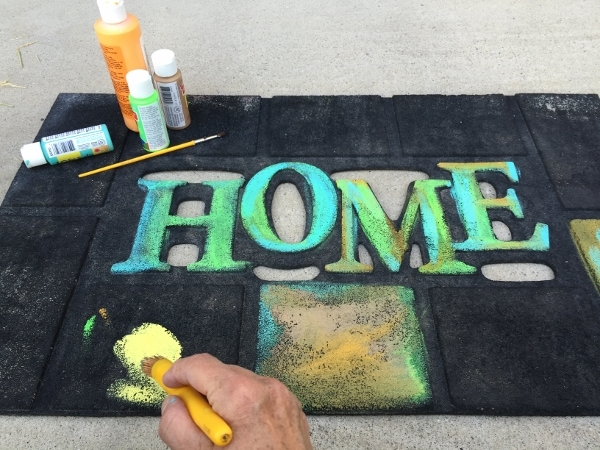 “Why couldn’t I paint the old mat and see if I could make it pretty again?! !” I mulled the idea over in my head for a few weeks and finally today I tried my hand at bringing the beauty back to my very special welcome mat. Acrylic paint from the craft store and a couple brushes and sponges was all I needed. 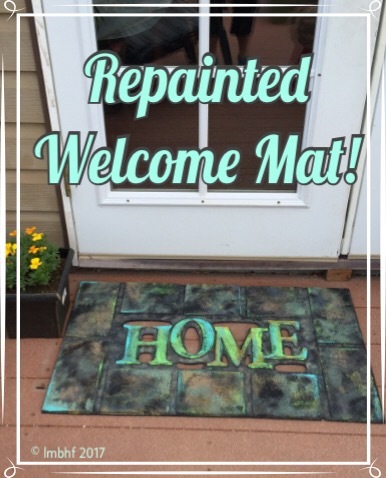 If you don’t already have a welcome mat that needs painting, like I did, you can purchase a plain black one and ccreate your own design. 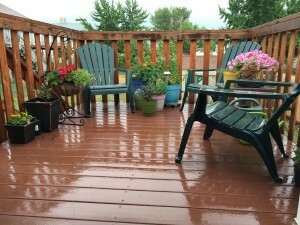 This is a photo of my beautiful deck, looking out from the door and the before and after pics of myWelcome Mat. I think I kinda like it!! Here is everything you need to paint your own Welcome Mat. Just click on the image or description to be directed to Amazon where you can purchase the products. I love that you re-purposed the mat! I always have ideas and don’t follow through. Chardae, it took me a long time to get around to it, but now I’m really glad I did! Great idea. I have a mat just dying to be painted. What kind of paint did you use to make sure it didn’t run? Natasha, I used acrylic paint from the craft store. I’ve used the same paint on fabrics and it works great! 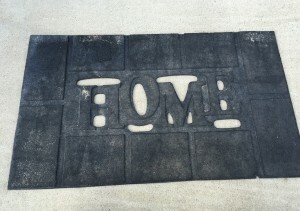 What a great idea to revitalize worn welcome mats! I have a door mat from Crate and Barrel that I absolutely love but which has become faded with time. I was planning to replace it this summer, but now you have me considering the possibility of bringing it back to life. Thanks for sharing your creativity! Thank you Denay! You should do it! I had fun painting mine and I’m pretty happy with how it turned out. Wow the painting gave the once sad colorless mat and brand new life!! Love it! This is a great idea! I have a welcome mat on my back porch that’s looking a little sad. Painting it would definitely bring a little life to it and my little ones would love the project! What type of paint did you use? Very nice! I would have never thought you could paint a mat like that. Thank you Lori for sharing this post at the #WednesdayAIM #LinkUp #BlogParty. I shared it on my social media sites. Great repurposing idea. Makes it stand out so much more. Thanks for linking up with blogging grandmothers. What a great project! I love the colors and the way it looks on your beautiful deck. Looking at your deck makes me want to get mine together for the summer. Thank you for sharing with #blogginggrandmothers. I have shared on social media. 🙂 Come again and bring a blogging friend. Again, very nice! I would have never thought you could paint a mat like that. Thanks Lori from Grammy Dee, #BloggingGrandmothers #LinkUp #BlogParty, social media shared. This looks so much better painted. I had plans to paint a faux welcome mat right on my porch floor. With this post I have changed my mind. I am going to just paint a normal mat. Thanks for the inspiration.